Scientists have ruled out the possibility that methane is delivered to Mars by meteorites, raising fresh hopes that the gas might be generated by life on the red planet, in research published in Earth and Planetary Science Letters. Methane has a short lifetime of just a few hundred years on Mars because it is constantly being depleted by a chemical reaction in the planet’s atmosphere, caused by sunlight. Scientists analysing data from telescopic observations and unmanned space missions have discovered that methane on Mars is being constantly replenished by an unknown source and they are keen to uncover how the levels of methane are being topped up. Researchers had thought that meteorites might be responsible for Martian methane levels because when the rocks enter the planet’s atmosphere they are subjected to intense heat, causing a chemical reaction that releases methane and other gases into the atmosphere. However, the new study, by researchers from Imperial College London, shows that the volumes of methane that could be released by the meteorites entering Mars’s atmosphere are too low to maintain the current atmospheric levels of methane. Previous studies have also ruled out the possibility that the methane is delivered through volcanic activity. This leaves only two plausible theories to explain the gas’s presence, according to the researchers behind today’s findings. Either there are microorganisms living in the Martian soil that are producing methane gas as a by-product of their metabolic processes, or methane is being produced as a by-product of reactions between volcanic rock and water. The team say their study will help NASA and ESA scientists who are planning a joint mission to the red planet in 2018 to search for the source of methane. The researchers say now that they have discovered that meteorites are not a source of Methane on Mars, ESA and NASA scientists can focus their attention on the two last remaining options. 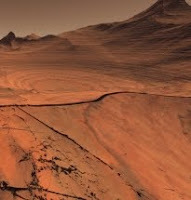 The team used a technique called Quantitive Pyrolysis-Fourier Transform Infrared Spectroscopy to reproduce the same searing conditions experienced by meteorites as they enter the Martian atmosphere. The team heated the meteorite fragments to 1000 degrees Celsius and measured the gases that were released using an infrared beam. When quantities of gas released by the laboratory experiments were combined with published calculations of meteorite in-fall rates on Mars, the scientists calculated that only 10 kilograms of meteorite methane was produced each year, far below the 100 to 300 tonnes required to replenish methane levels in the Martian atmosphere.